The equipment accords with CGMP standard and meet the requirements of FDA. The special designed air axle seals, compresses the air through an accurate filter, form and is isolated the air seal room, produce pollution in order to prevent the powder from falling into main shaft and pivot which cuts one hundred sheets Multi-Lock devices heavily each other safely much, operate more safer. Control system can adopt PLC with man-machine interface control, Can in accordance with raw materials characteristic or special process requirements, it can input many different group of process parameter; After the conditions are all set up, it will can do full-automatic all procedural control. The man-machine interface can be set up by multiple grade of password, to avoid failure by artificially. The twin-shaft airtight trimming talons can press the irregular granules through the meshes to form the uniform granules as required. 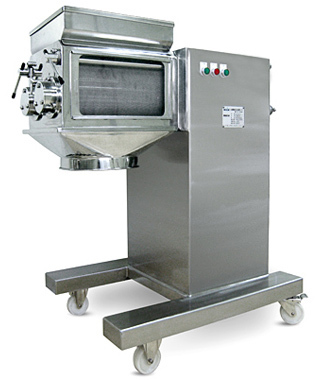 Suitable for processing the dry granules in different sizes that have been processed with granulation or pulverization to trim them as the granules in uniform size. Applicable to high-precision pulverization, wet granulation, dry granule-trimming, it is multifunctional twin-shaft equipment for granulation. Introduced a package main shaft with high-precision design, low temperature rise that can ensure the quality and characteristics of raw materials. Sealing design of rotating shaft can remove the contaminating spot and ensure the product quality. Simple structure, meshes are designed for easy disassembly and cleaning. 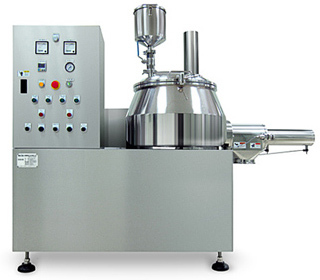 Can be accommodated to the application of pulverization & granule-trimming during the material vacuum-suction.